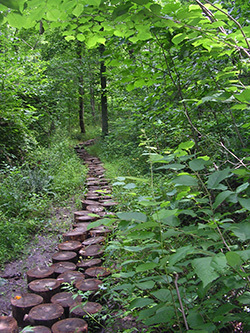 Haw River State Park was authorized by the General Assembly in 2003 as part of the state park system's New Parks for a New Century initiative. The area was one of 12 sites in the state identified with the potential for state park development based on its natural resource value, recreation potential and proximity to urban areas under-served by the state parks system. The park headquarters are located near the headwaters of the Haw River. The park began with an initial 300 acres of land just north of Greensboro and bordering both Guilford and Rockingham counties. 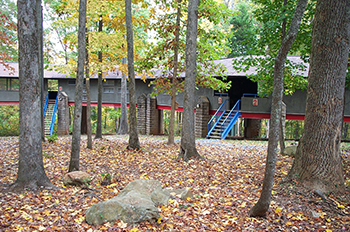 The first major acquisition for the state park was the Summit Center, a Retreat and Conference Center previously owned by the Episcopal Diocese of North Carolina. Known as the Summit Environmental Education Center (SEEC), the facility is now operated as the Division of Parks and Recreation's first residential environmental education center and also provides conference facilities which can be rented for group activities. In 2010, an additional 700 acres were purchased to add to the park. North Carolina Division of Parks and Recreation. Haw River State Park. http://www.ncparks.gov/haw-river-state-park/education (accessed November 18, 2015). North Carolina Division of Parks and Recreation. Haw River State Park Master Plan. April 2010. North Carolina Digital Collections. http://digital.ncdcr.gov/cdm/ref/collection/p249901coll22/id/70589 (accessed November 15, 2015). [Trail in the woods, Haw River State Park.] Photograph. ca. 2006. North Carolina State Parks Collection. [Cabins, Haw River State Park.] Photograph. April 21, 2008. North Carolina State Parks Collection.